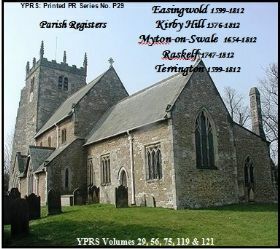 The Yorkshire Parish Register Society was founded in 1899 and became a publishing section of the Yorkshire Archaeological Society (now the Yorkshire Archaeological & Historical Society) in 1960. The aim of the Society was to transcribe and to produce annually at least one volume of an original parish register. 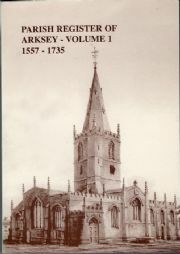 The section ceased to publish printed volumes in 2014, by which time 180 volumes had been published, the last one being the Records of Stainburn Chapelry. Almost all the volumes contain indexes to surnames, Christian names, places and occupations. From the 1950s volumes have included extra material to be found in the Bishop's Transcripts, especially useful where parts of the original registers are deficient. By 1837 (the latest date covered by any of our volumes and also the year in which civil registration was introduced) there were more than 750 Church of England parishes in Yorkshire. We have details only of those parishes listed on this website. Printed registers still available in book form. Printed registers which are out-of-print but available on CD (P series). Please make sure that you check all listings. Be aware that some CDs and the downloadable versions, contain records for more than one parish, and that others, particularly for large parishes, cover only a limited period of years. Almost all original parish registers for Yorkshire are held in either a County Record or Archives Office. There are at least 15 offices holding original registers and several holding Bishop's Transcripts.